Fallout 4 created by Bethesda Game Studios. Images used for educational purposes only. - In order to access Concord Civic Access you must first complete the quest When Freedom Calls up to the point that you encounter, and kill, the Death Claw. Once the beast is gone and everyone is headed to Sanctuary, look at the spot on the street where the Death Claw emerged. (It’s straight down the road from the Museum of Freedom, if you’ve forgotten.) There’s a small tunnel down here leading to a door, and through the door is the Civic Access. - Concord Civic Access opens into a small office. There’s a door straight ahead with chains you can undo; there’s also a hole in the wall on your right. Go through the door first. It leads to another small office, inside which you’ll find some ammo and meds, as well as a Novice lockbox with more of the same. (Open the Vault-Tec Lunchbox in the closet, or whatever it is, for a nice surprise.) The stairs here lead to the hole you passed before, and you’ll have a better vantage point for shooting the four Mole Rats that come at you. V.A.T.S. ‘em up. If you take the first set of stairs on the right you’ll find a ladder back up to Concord. You’ll wind up in a back alley. Stay on the lower level and take the first left and you can find a small back passage. It leads to a Novice locked crate. There’s some Rad-X, and… naught else. There’s a Raider body with some loot near where the Mirelurk was mire-lurking. If you hop up onto the ledge beside this body (it takes some weird hopping from atop the concrete blocks) you’ll find a stash of drugs, as well as a Caps Stash. To the left of the corpse is a back room with a steamer trunk and several other boxes full of goodies. You’ll find a Taboo Tattoos magazine sitting in front of the trunk. You can even sleep back here, if you want. The catwalk above the water leads to another split in the path. 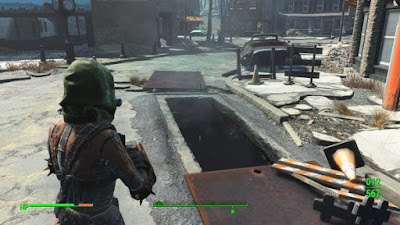 You’ll find several Radroaches if you take a left and go up the stairs; you’ll also find a side room with some meds, as well as another exit back to Concord. If you take a right and go down the darkened stairs you’ll loop ‘round to the room with the bed again. - That’s, uh… that’s it! I think. ‘kay! Kinda useless, actually, but at least there are items to grab. You don't have to finish quest to access tunnel. There is an access panel behind buildings that leads you down. I did this first before quest. If you already have fusion core before asked to get it you have added speech option to say "got it already"
ArrPeeGeeZ copyright 2016 by Matt Bird. Games copyright their respective owners. Powered by Blogger.